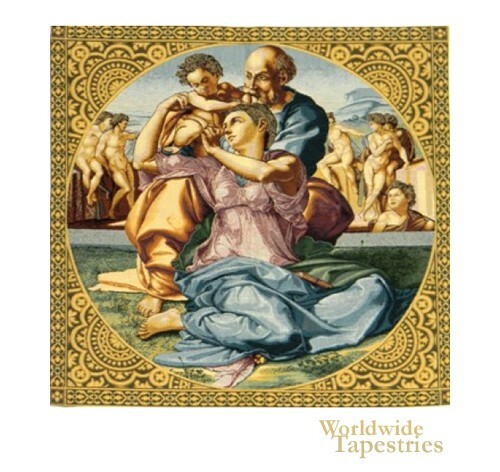 This religious tapestry "The Holy Family" is inspired by with work of Michelangelo Buonarroti from 1503-1504. The original is now in the Galleria degli Uffizi. From Florence, this painter, more well known as simply Michelangelo, created works which often involved religious scenes and figures. Here we see the Holy family with the Christ child. Behind in the background, we see other figures. This religious tapestry "The Holy Family" is lined and has a tunnel for easy hanging. Dimensions: W 25" x H 25"